I have never entered quilts in a quilt show before. Last year a member of the guild challenged me to enter some this year. Here are my quilts. I must say it was a thrill to walk around the corner and see one of my quilts hanging next to other quilts. I was totally amazed at how beautiful it was. When you work on quilts, you work up close and you know all the mistakes made and choices of fabrics that could have been better. But when you see them hanging up so proudly next to other beautiful quilts, you realize you did good and should be proud. I am. The above quilt was finished after taking a class the guild offered. We were not shown a sample of what we would be making. We were told to bring coordinating fabrics and black. I chose fabric I had from a line of Timeless Treasures called Wildflower Rhapsody. It all blends well. I wouldn't have put the black squares in had I know how it would all turn out. Other than that I really like this quilt. It often hangs on the wall in my house. It was the first time I had used Eleanor Burns flying geese rulers and loved that the points came out perfect - not something I had done before. Thanks Eleanor! The above quilts was made from a book I purchased at the guild. It was such an easy quilt to make even though it is a queen sized quilt. The trick I found to keep all the colors in the right place was to draw out a quick sketch of what went where, colored it and then put swatches of the fabrics next to a legend of the colors in the sketch. I am amazed at the colors I chose for this quilt. I am usually much more subdued in my choices. I had purchased the star fabrics at an African shop in Fort Bragg California when we were there several years ago. I wanted to make something with them but just didn't have a clue what. When I saw this pattern, I knew they would work well. Those fabrics were hand dyed fat quarters that were made in Africa. The texture of them is much thicker than the rest of the batiks throughout the quilt. I love this so much that I hope it gives me the freedom to try other bright colors. Using the same pattern as the African Batik one, I made this quilt. Again I had a package of fat quarters that I just didn't know what to do with. I used the same technique of drawing out the pattern and coloring in what color went where. This quilt is a king sized quilt. It has a black backing. I am not a purple kind of person, but I think this will be on my bed after it comes back from the show. Earlier this year Barbara Olson came to our guild from Billings Montana to give a presentation and then offered two classes after that. I took both classes - the above Castles class and another one that involved a lot of spirals. I have not finished that quilt and may never. It was difficult. I loved doing this castle class. When I got the castle with the flying dragon on it finished, I just didn't know what to do to next. I knew it needed something to really highlight the castle. I found the purple inner border at Beverly's Fabrics in Citrus Heights and fell in love with it. Still I felt it needed something more, so on to make those paper pieced points. Wow! What a job that was. I love how it all turned out, though. It was worth all the cussing and crying and wondering what in the world I was doing along with the ripping out stitches over and over again. I am really proud of how it turned out. The above quilt was made a couple of years ago for my granddaughter, Faith. She has done tumbling and cheer leading since she was tiny and is very good at it. The blocks were cut using a tumbler design from Missouri Quilt Company that I bought on a whim because it was a super buy on their website. The purples are from a layer cake that I had acquired some time ago accompanied with a purple fabric that I had that was part of the Wildflower Rhapsody fabric I had left overs of. When I was all done making the quilt top, I felt it needed something more. I felt a flower would add pizzazz to it. I appliqued the petals and then came up with the big center. This quilt will never be a comfortable quilt to lay on, but I think it turned out beautiful. Faith seems to like it, too. I had to borrow it back from her to enter into the show. The next picture is the flower up close. The guild each year distributes two pieces of fabric for a challenge project. We can make anything we want, but the fabric has to be displayed prominently. This "Stuff Who" quilt was my submission to that contest. I didn't win, but I love the quilt. I took a lot more pictures of the guild's show. I don't like to post those pictures before the show is over. So come Monday or Tuesday, I will put them on the blog for all to see. There were some beautiful quilts there. Tomorrow, Friday November 20th, is the start of the River City Quilt Guild's annual quilt show. Someone asked me last year why I never submit quilts to our show. So this year I submitted six quilts. Two to be judged. Four just for display. I also entered seven quilts for the silent auction. I hope they all sell. I entered ten silent auction quilts and sold all but one. But I priced them dirt cheap. These are priced low but not cheap. We will see. I am the guild's historian. I went over yesterday to turn in my quilts and took pictures before set up began. Chairs had been brought in. Tape was being put down to mark the vendor spaces. Other than that it was empty. This morning I was there around 10:30. Racks are going up. Quilts were starting to be put out on tables. A special kudos to David Carter, who lays all this out. This year was a challenge for him. 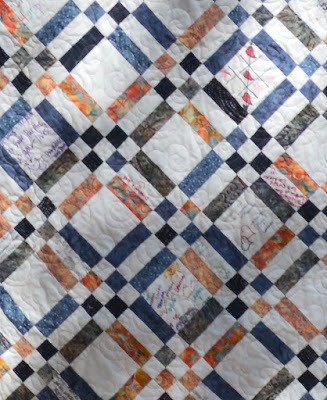 The guild had over 300 quilts entered into the show. It is going to be a great show. If you can come by and see it. The show runs from 10 a.m. to 5 p.m. Friday and Saturday. Sunday it closes at 4 p.m. 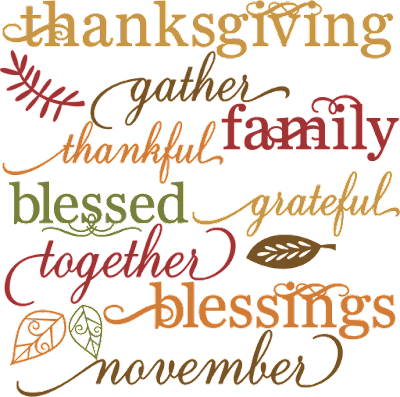 It is held at the Scottish Rites Center at 6151 H Street Sacramento CA. Parking is free and they have a huge parking lot for us. Entry is only $7. 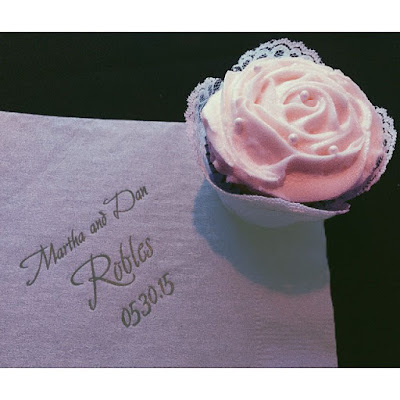 I have been so busy that my blog has gone by the wayside for a while. Our quilt guild, the River City Quilt Guild in Sacramento, is getting ready for their annual show. I have submitted some quilts that I had to finish or sew hanging sleeves on the back of. I still have three more sleeves to sew. I also participate in our Country Store at the show. I have been going through my stash and deciding what fabric and patterns I am willing to part with. Some of the fabric I have had since I closed my shop down five years ago. I think it is time to say goodbye. If I were going to use it, I would have. So I have been pricing all that and now need to tag it all. The show is next week afterall! Yipes. I have to get busy. I will post pictures when I am done. Oh and to those of you who follow Beehive Quilts on Facebook, I cannot get into it. Facebook as determined I am a business and cannot have a stand alone Facebook account. They said I had to link it to my personal account. I tried to do that and it doesn't work. So if you are trying to contact me through that Facebook page, I am not seeing it as I am locked out of it. I am trying to work with Facebook about this, but they are hard to work with as they want me to just do what they say and don't have contact info anywhere on their site. I will keep trying. 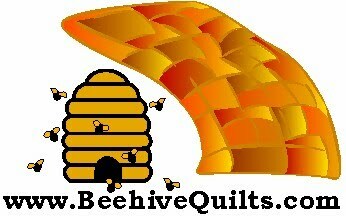 You can always contact me here or at my e-mail at contact@beehivequilts.com. Friday Venita and I had the opportunity to go listen to a quilt lecture given by Marianne Fons and her daughter, Mary Fons. This was given at the main Meissner Sewing Center in Sacramento. We had a great time and loved meeting both of them. They even set up a special place for us to take pictures with them when the lecture was over. So I did. Mary Fons on left front. Marianne Fons right center. Of course I am standing behind them. Marianne lives in Sommerset Iowa. She loves her downtown area and recently purchased the movie theater there and is restoring it. The following picture was taken as we were all settling down and getting ready for the show to begin. This is Mary Fons. She is a very animated presenter and found her quite fun. She and her mom were great together. Of course they have had a lot of opportunity to work together on the PBS Fons and Porter show. Both ladies were very personable. Below is Marianne Fons. Below is one of Mary's quilts. Venita bought the book this is patterned in. I really love the outside border. This is really a beautiful quilt, too. I love they used just solid colors. I am finding I am moving to using solids more than flowers or other pattern. I really like how they make the design of the quilt stand out instead of the fabric itself. Below is one of Mary's first quilts. Pinks with navy blue contrast. Very stunning. Very small blocks. This one is Marianne's quilt. I love it because it gives the appearance of being a funky quilt. But each of the blocks is the same size. It is the contrast between the light and darks that make it seem the blocks are different in size. Simple quilt yet stunning. Quilt below is a log cabin made by Mary Fons. One quote I came away with that Marianne said is, " When you make a mistake in your quilt just state: 'It symbolizes something in my life.'" Love that. We all make mistakes in our quilts. Learn to live with them. Don't tell others that they are they and definitely don't point them out. Most times no one notices. Loved the presentation. 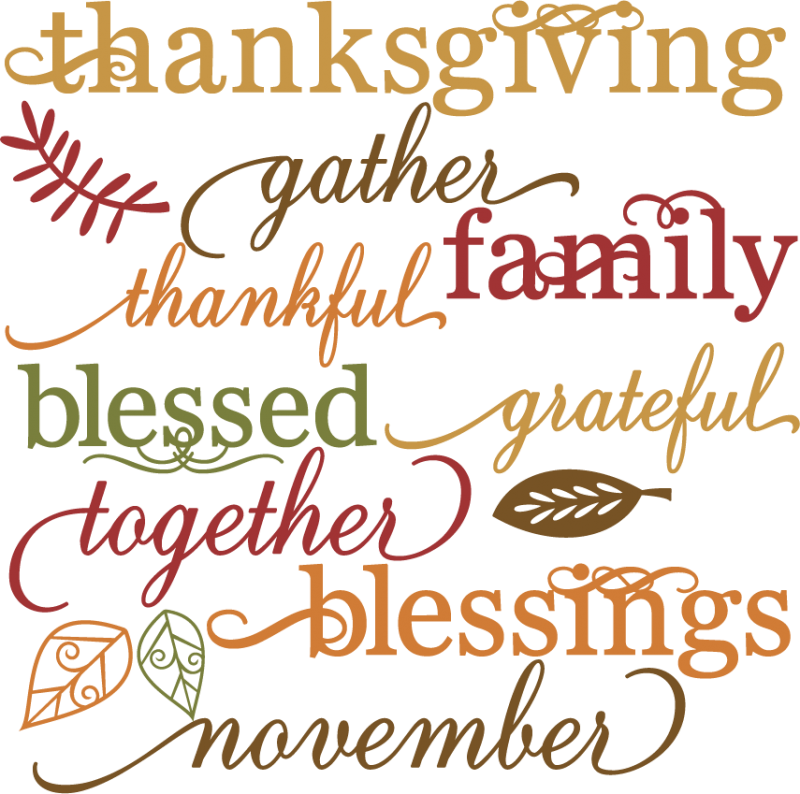 Thanks goes to Meissner's for giving us great quilters with great stories to tell and beautiful quilts to see. And one of these days I am going to win one of the sewing machine give aways!!!! You can see more of the attendees at https://www.facebook.com/MeissnerSewing. Oh my goodness this is a big quilt. It is the largest one I have quilted. I have made a couple this big, but Elisa always quilted them. This may take me a while to finish. It measures 94" x 98". I am using a popcorn stitch to quilt it with. It is a new-to-me pantograph with lots of back and forth motions. I think it will go fast once I get the hang of the pattern. I don't normally do bright, bright colors in quilts, clothing, decor or anything else. I like it. I bought several fat quarters from a shop in Fort Bragg California several years ago. It imports most of its products, including fabric, from Africa. The fat quarters were hand dyed and very stiff. Loved them but didn't know quite what to do with them and so they sat in my stash for a few years. I have one border yet to put on it before I can quilt it. It is entered in the River City Quilt Guild show in November. If you are around the Sacramento area at that time, stop in and see it in person. Long Arm Quilting - I am doing it! I have mentioned before that I have a long arm machine sitting in my dining room. It belongs to Elisa, my daughter. She works full time and goes to college, so it doesn't get used much. I have done some work on it - mostly freehand. Elisa does such good work using pantographs that I have always let her do them. I have several tops done and finally figured if I want them quilted, I best learn how to do it myself. I mentioned before that I had a scrappy quilt that I call Green. I finished the top last year and it has just been sitting waiting for a quilter to come along and quilt it. I even had the backing prepared. So last week I quilted it. I am currently working on the binding as I watch TV in the evening. Above was taken on the day I was actually quilting it. I think you can see why I named it Green. Today I worked on a quilt that our church is donating to a local charity. They were going to tie quilt it Tuesday. I said let me take it and quilt it on the long arm. It is prettier, lasts longer and gives me practice on the long arm. Here is it upclose. I used used a pantograph called Sunny Day. It has a shining sun, a butterfly and a leaf running through it. It is a cheerful Little Mermaid quilt with a sunny, cheerful quilt design on it. I am now a long arm quilter! In fact I am offering out my services to anyone willing to take a chance on my new found abilities and I will do it at a reduced rate from more established long arm quilters. Check out the tab above for details. 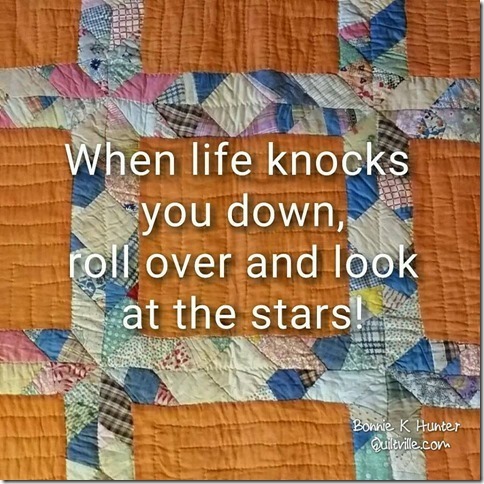 I have been going through some pictures of quilts I have made and have some posted under the My Quilts tab at the top of this blog. It has been fun going through the pictures. I have many more to post, but I also have dinner to prepare. I have also added my most recent Row by Row row to the other tab. In my dining area sits a very big long arm machine that belongs to my daughter. Since she works outside the home, it is not used very often. She gives me full use of it, but I like her doing my quilts more. I can free motion on the long arm, but I like the looks of a pantograph quilted quilt more. Today I got out Green. Green is a quilt I made using scraps from my green stash. That's its name. Green. Green has been pieced for close to a year now. I thought since it is a scrap quilt, it can have scrap quilting. So I pinned it to the leaders this morning and figured I would work on it here and again. Well I have it almost done and it is not too bad. I did goof up the first half of the first row because I had it on a basting stitch. The top looks good, but the underneath is a mess. I will have to go back and redo that part. I used a pantograph of a ginko leaf. I really like it and it is a little more forgiving than some of Elisa's pantographs. Who said old dogs can't learn new tricks? Oh no Row by Row row today. Been working on this instead. Maybe tomorrow. See the write up on the above two rows on the tab above called Row by Row. You have to scroll down because I am writing this up like an on going story starting at the beginning. You get to see all my rows that I have done so far. Eventually you will get to see the quilts that came from the rows. I love when quilt stores flag the front of their stores so there is no question where they are and what kind of store they are! No name is needed. Just say quilts and we will come! From the outside, Whistle Stop Quilts looks small, but it isn't. It is housed in the corner of an L shaped shopping center. The front is small but then it angles back and is actually one of the biggest quilt stores around. Lots of room for a large classroom, which is nice. Nice bathrooms, thank you very much. Lots of room on the walls to put up samples to advertise classes or fabric selections. Look at that pieced border!!!! Nice cozy sitting room. Love the quilts on the wall. They have a huge selection of batiks - probably the most I have ever seen in a shop. Love them. I was looking for a gray batik for the backing of a king sized quilt. They had their batiks on sale for 25% off the day I went in. Thank goodness because I needed 10 yards of it. Helped keep the cost down. I also got their Row by Row kit and license plate. It is of the Auburn bridge over the river. I haven't made it yet but will soon. Good design on it. Love you Whistle Stop. I wish you were closer. On my quest to get more Row by Row kits, Gil and I found ourselves in Colusa California a couple of Saturdays ago. They have a cute little quilt store there. It is located right downtown - very easy to find and well worth the effort to drive out of your way to get there. For such a small shop, they have a lot of fabric and ideas going on in there. She said it was made with a single jelly roll for the main part of the quilt. It was done with the original jelly roll technique. Must try it. Also if you are in or around Colusa stop in and say hi at the Friends Around the Block quilt store. Singer Model 15 Sewing Machine - For Me! Gil was doing some online auction shopping the other day and look what he found! He bid on it and got it. It is definitely not a featherweight. This weighs over 30 pounds. Featherweights weigh about 11. This can sew nicely though. It came with its carrying case but nothing else. We looked on line and you can buy all kinds of extra feet for it and replacement parts. I had to call Singer to find out when it was built. They had an electronic manual on their website for free. Yeah! I love free. This little beauty was built in July 1946, so it is older than Gil or me. And runs better than us, too. Sugar Pine Quilt Store in Grass Valley California is a darling quilt shop. It is in an old home and every space in that "home" is used to sell quilting supplies. Never fear those stairs, they have a ramp for those of us that look at stairs and say "Whoa, those are steep!" It does, from time to time, snow in Grass Valley. I always worry about things that should not matter to me. When would I ever go to Grass Valley to shop for quilt fabric in snowy conditions? Never. These are just some of the rooms that are filled with fabric, books, patterns and notions. If you think samples in quilt store don't matter, think again. I saw this quilt hanging and had to walk up close to take a look. The pattern was hanging on the wall next to it. Of course I HAD to purchase it. Not like I don't have a few other projects I want to accomplish. 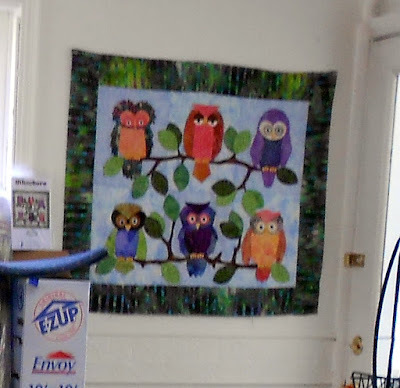 I bought it because of the upper left owl - the one having a bad feather day. Just too cute. Having driving in from Yuba City, I needed to use the restroom. I love quilt store restrooms. Every one tries to make it cuter than the next. My all time favorite is Quilter's Corner in Sacramento. I think I have a picture somewhere of it. I will look for it. Later. Anyway I had to take some pictures of this one, too. The obligatory quilt was hanging in there. I love earth tone quilts, so it grabbed my attention right away. Plus rabbits - too cute. Then there were two announcements of up coming events that I wanted to remember. Easier than finding a pen and paper and writing the info down. I took pictures. Gotta see if my dear husband wants to go to Arizona in October. Better than July or August, for sure. Elk Grove's guild is having their quilt show. I have only been to it once, but I won a big raffle basket from there. Plus I saw a few friends down there. Must get on calendar and go this year. Venita? Wanna go with me? I had a great time on this trip we took seeing all these quilt stores last Saturday. Thanks, Gil. Oh, I did remember to buy their Row by Row kit and license plate.